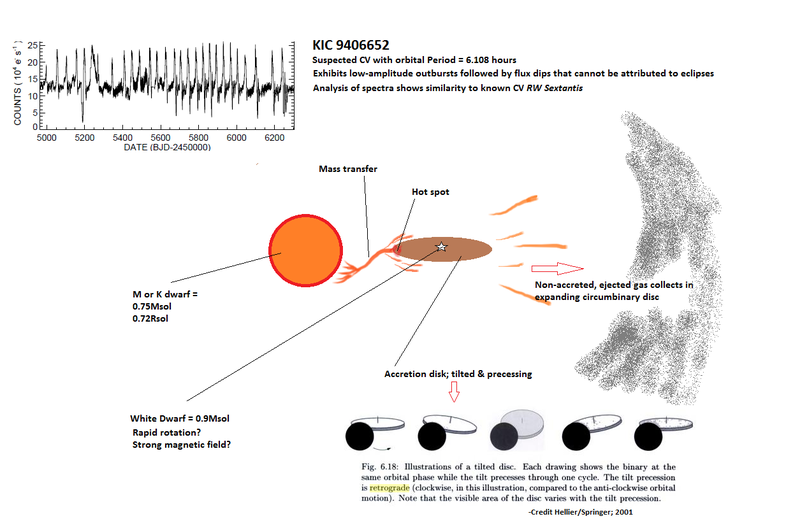 Taichi Kato of Kyoto University and Yoji Osaki of the University of Tokyo recently published a paper on an unusual dwarf nova spotted by Planet Hunters’ volunteers that was contaminating the photometric aperture of a Kepler target star. A dwarf nova is a binary star system where one of the pair is a normal star and the other is a white dwarf. The objects orbit so closely that material from the star is falling onto the white dwarf with an accretion disk of material around the white dwarf. The light from the system is dominated by the accretion disk. Thus changes in brightness reflect the temperature and state of the accretion disk. This is the 2nd Planet Hunters dwarf nova/cataclysmic variable find to be published in the astronomical literature. Congratulations to the volunteers involved. The first Planet Hunters discovery paper was published in the Fall of last year, and you can read more about that object here. Drs. Kato and Osaki found the discussions about this light curve from a volunteer curated blog that highlights interesting finds from Talk and the Talk thread about this interesting source . They went on to follow-up the find and further investigate the dwarf nova combining ground based, space-based telescope data, and the Kepler light curve. They found that this dwarf nova exhibited unusual features in the light curve (brightness of the accretion disk) for having a very short orbital period of the companion star. Congratulations to all involved in this intriguing find. You can read about the study in detail with the preprint of the paper available here.